During the last two decades, public sector restructuring has become a global trend. Restructuring has also occurred in the port sector, which later known as the port reform. Many developing countries have been implementing port reform with the aim to improve the port performance. For those countries that manage the port with a monopoly by the state or by state owned companies, port reform has often been interpreted as to open the opportunity for private sector to participate in port management. The Indonesian government has enacted the law number 17 of 2008 concerning Shipping, replacing the previous law on shipping (1992) which legitimized the monopoly of port management by state owned companies (IPC). The shipping law (2008) has mandated the Government to establish Port Authority. As a representative of the government, the Port Authority plays a role in providing concessions to the Indonesian legal entities to operate terminals / ports. This is commonly called the liberalization of port management. This thesis will examine how significant the implementation of the Shipping Law (2008) affecting the port reform. Many obstacles will be encountered in the implementation of the Shipping Law (2008) either institutional constraints or political constraints. IPC as the incumbent would be directly affected by the implementation of the Law (2008), but how strong this impact will affect the IPC depends on the interpretation of the Shipping Law into its implementing regulations. 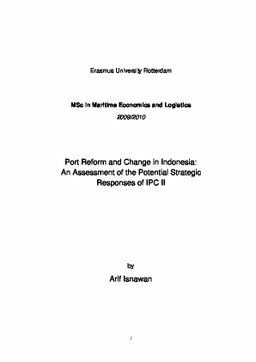 Therefore, this thesis will also discuss the strategic responses by IPC in anticipating the implementation of the new Shipping Law.